He stayed up past 12 a.m. some nights, pressing his pants, shining his shoes, polishing his brass. The four sharpest soldiers in the 508th Parachute Regiment guarded General Eisenhower two fellows at his desk, two fellows outside his door. Pfc. Ted Lee was usually one of those fellows. "He was a good ol' general, an enlisted man's general," said Lee, sitting inside his Casper home, wearing the uniform for Eisenhower's honor guard: white gloves, white scarf, the 508's badge -a red devil. Sixty-five years after Lee stood guard outside Eisenhower's door, his fellow soldiers are dying at the rate of 1,000 a day. Lee wants people to remember. If Lee had been a soldier during World War I, his uniform would have had a line of brass buttons on the jacket, and soldiers would have been required to polish each one. Eisenhower thought that silly. He ordered a flap to cover the buttons for World War II uniforms and let soldiers worry about more important duties, Lee says.
. On the way home, Elwood wrapped his dad's Buick around a pole in Deaver: "He thought the world of that car. We went and wrecked it." deliberately crash behind enemy lines, bringing in men and supplies. They were pulled through the air by other airplanes, on a cord, like a kite on a nylon rope. Lee's assignment, however, took him to Frankfurt, Germany, as part of Eisenhower's Honor Guard. He helped run camp, taking care of the tanks and the Marines who lived there. "Where you from, trooper?" Eisenhower asked. "Cody? That's by Yellowstone, isn't it?" Eisenhower asked if he could come see it sometime, and Lee offered to show him around. It never happened, of course. Lee had a life to build. He met his wife, Jackie, and has been married to her for 60 years. They raised four boys, have nine grandchildren and five great-grandsons. He worked five years for the Wyoming Highway Patrol and 28 years as a parole officer. He built his own house and got to name the road leading up to it: Lee Lane. His Eisenhower guard uniform still fits, and he'll wear it now and again for special occasions. 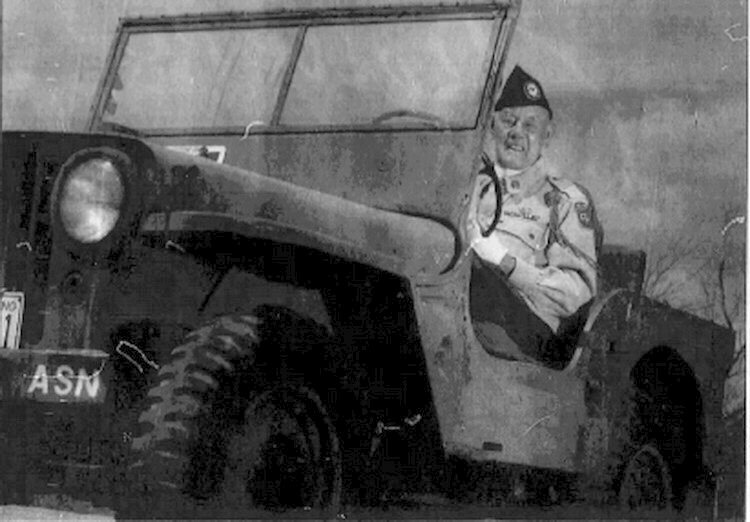 In parades, he drives a World War II-era jeep and goes into classrooms to talk about the war. He shows the kids a V-mail, a single page that, folded just right, makes an envelope. It was in a letter like this, in a few handwritten lines, that his mother told him the fate of Elwood, his best friend: dead just nine months after he went to war; shot through the stomach. Lee was the youngest of five brothers, all of whom served in World War II. The oldest helped develop a landing craft in the Philippines, another served on a submarine, and two others helped defend the Aleutian Islands from the Japanese. At one time, when his mother hung her Blue Star service banner in her window, it had five stars. Lee is the only brother left now. Though all survived the war, time is catching up to all World War II veterans. Each of Lee's brothers was buried with a replica of his mother's Blue Star banner that hung in the window laid across his chest. When his time comes, Lee, now 87, will also be buried with his over his chest.